Known alternately as Scottish Barley and The Classic Laddie, this expression from craft-distiller Bruichladdich is a NAS whisky. I have to admit a fondness for the place after having visited; I like their style. It was our last day on Islay, and after a busy morning walking from Port Ellen to Ardbeg (more on that later!) we decided to head out into the hinterlands for a drive. We took the road out to Port Charlotte, a tiny village at the end of which the A847 went from two lanes to one. That was all for me, I had had a bellyful of driving on tiny little roads and we headed back the way we came. Portnahaven would wait for next trip! What, they think they own the road? It’s an interesting little place, a whitewashed structure and wall, through which you pass into an intimate little courtyard to park. The tasting room is through a brightly painted (turquoise) door, low-ceilinged, liberally provided with couches on which whisky overs lounged in quiet repose. There was the usual display of t-shirts, jackets and the like, and a wide bar where a kindly woman of mature years welcomed us gaily and immediately offered us a taste. Why, of course, why not? I expected the usual: “Here’s our standard, if you want more sign up for a tour.” But she led us energetically through tastings of four expressions (of which I took the tiniest sips, as I was still driving, grr.) We had the Classic Laddie, the Islay Barley (both unpeated), the Port Charlotte and Octomore (latter two peated). Note: though I growl about NAS whiskies, these all lacked an age statement and yet I enjoyed them all. Okay, I admit I added the Tardis. On returning home, the wife remembered liking one of the unpeated expressions, so I took a guess and bought the Classic Laddie. At about $50 US it represents an entry point for a solidly good single malt. There are 10- and 12-year old whiskies form other distillers in this price range. But here is a NAS whisky once again positioning itself as good as any reasonable vintage. But this one is sporting all the trappings of the craft presentation: high ABV, no coloring, no chill-filtration. And what did I think? Well, read on. Nose (unwatered): Stings! Backing off: fresh grass and floral scents, lemon, honeysuckle, a definite maritime undercurrent. With a bit of water, mineral notes come out and more of the maritime air comes through. Palate (unwatered): Thick caramel (very pleasing), quickly turning tannic with a heavy oak presence. Vanilla throughout. With some water, it’s more peppery and loses some of that sweet caramel thickness, becoming a bit more harsh. Finish (unwatered): Fairly quick finish on tongue with oak and white pepper predominant. Aromas stick around for quite a while: cut grass, leather and a hint of Islay diesel wafting through in an almost spectral touch. Bottom Line: I really like the Bruichladdich approach to their product: old machinery, local terroir, owning the process from start to finish. They have some great tastes, and I think the Classic Laddie represents a refreshing youngish spirit. For $50, I think it is a reasonable choice for ‘something different’ with a clean, grassy airy character. 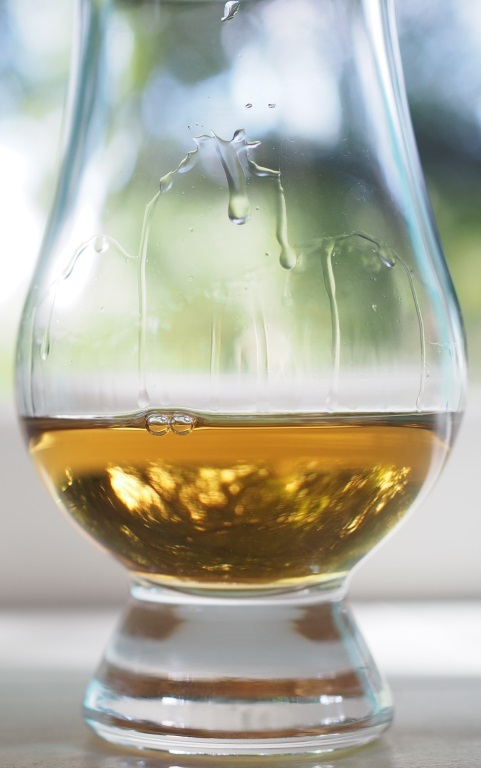 A summer afternoon dram, if you will. At 50% ABV, it delivers quite a punch, but for those who don’t favor such a bite on the nose, it unfortunately does lose something when watered. 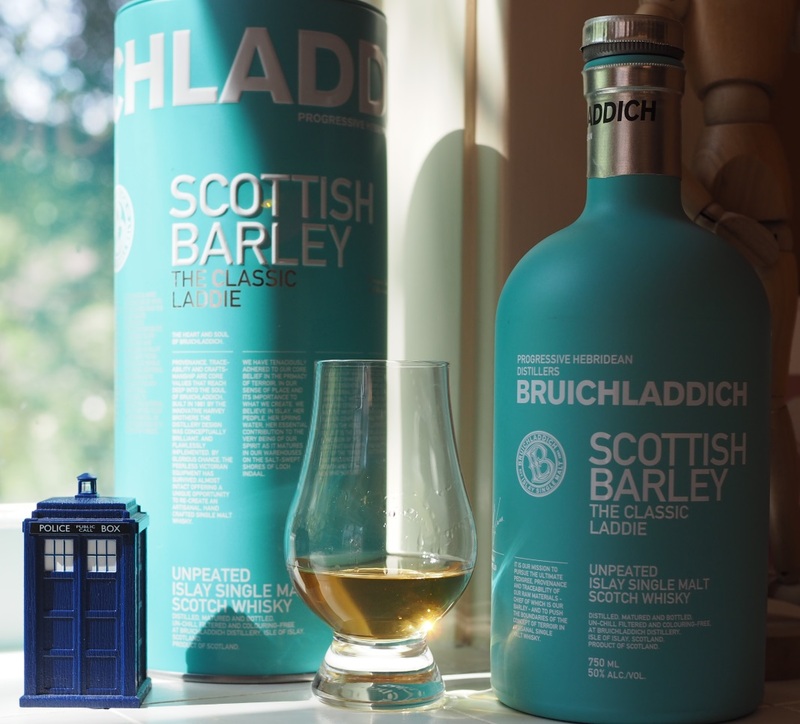 And compared to the good choices in the $50-ish range, the Classic Laddie’s freshness, its powerful opening blast of toffee and nice light notes are fighting other whiskies who have benefited by more years in cask. Not one for those who like a smooth whisky, it has to make its case with its unique and quirky aromas. The wife is telling me this is not the one she remembers from the tasting, so I’ve picked up the (more expensive, and also NAS) Islay Barley. More on that later! By the way, she has managed to finish off the Classic one single-handedly. We’re off to the package store for another! This entry was posted in Scotch-single malt, Whisky and tagged Bruichladdich, Classic Laddie, NAS, Scotch. Bookmark the permalink.